I’m not Being Bad Enough…. Leigh is…. but I am not… blocked in China. 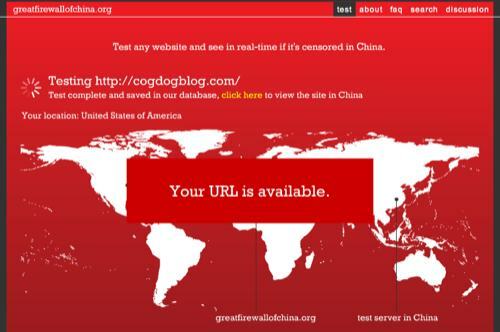 The Great Firewall of China is a site to test URLs if they are ones being censored by the Chinese government. I guess I am not being subversive enough. [The Aim] of this website is to be a watchdog and keep track of which and how many or how many times sites are censored. Help to keep the censorship transparent. Each blocked website will automatically be added to the great firewall on the homepage. How ironic. This (http://www.greatfirewallofchina.org/) is blocked in our school district. I am not blocked in China. Happy days (the Iranians still don’t like me though). Fear not — linking to this site will likely be enough to get you redlisted. Hmm… My blog is blocked too. Yet I am getting hits from central China according to Google Analytics – some place called Chengdu. Oh and Iran, Mongolia and Pakistan have been tickling my blog too. Then again with the filters being employed in US K-12 nowadays we’re essentially doing the same thing! I see it more as an interesting way to highlight the issue of governmental content censorship, and a public effort to shine light there. It is interesting though as others will likely make the same (erroneous) conclusion that if links are blocked at that point that they are blocked systemically. I wonder what the actual filter impact is across the region? Vito, Send 'em a wiki! Pronto!